What’s it like working as a Deck Officer? Working in an executive department responsible for the navigation, manoeuvring and safe handling of the ship, communications between ship and shore, the handling and delivery of cargo, and the operation of all lifesaving devices, the role of a Deck Officer is vital onboard a merchant vessel. As the highest ranking Deck Officer, the Chief Officer – also known as the First Officer – will have the ultimate responsibility for the handling of cargo and the efficient running of the ship. With the assistance of lower ranking Deck Officers, all of whom have to be certified by examination after completing the appropriate qualifying sea time, this team keeps the ship and its crew safe, secure and in business. As part of the deck department team, Deck Officers spend time on the bridge navigating the ship and out on deck where weather conditions can be dark and stormy, or beautifully warm and bright. On-board, Deck Officers usually have their own internal cabin with en-suite facilities, and on larger ships they may have access to leisure facilities. 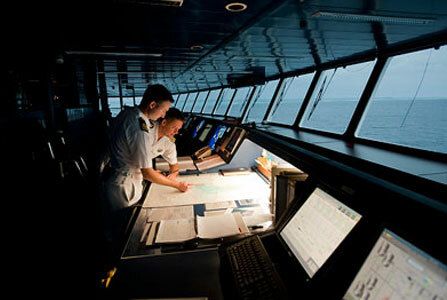 As work patterns for Deck Officers are in shifts for between a few weeks and several months at a time, Deck Officers spend long periods away from family and friends. However, holiday leave is generous in order to compensate for the time spent away from home. Deck Officers are often responsible for management of the Ratings (some of whom may not understand much English), navigation using satellite and radar systems, managing and using communication systems, and supervising the safe loading, storage and unloading of cargo. They can also be in charge of monitoring and supervising the maintenance of the ship’s safety and firefighting systems and equipment, making stability calculations, record-keeping, and training. In essence, Senior Deck Officers handle the administrative, financial, legal and commercial matters relating to the ship, in comparison with the ship’s Master who has overall responsibility for operations. As there is no central hub for Deck Officer recruitment, potential candidates must approach ship owners and managers or training organisations directly to find sponsored training opportunities. 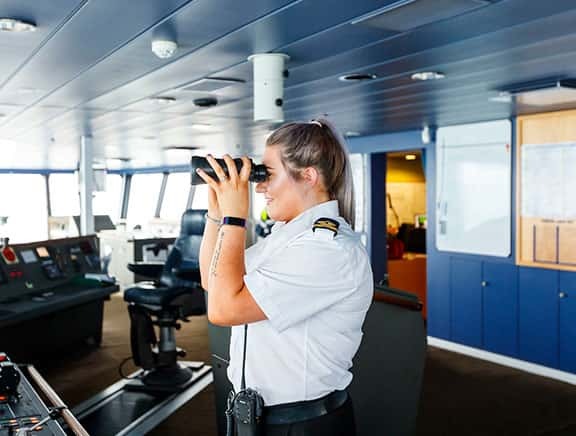 Deck Officer training incorporates onshore studies in shipboard familiarisation, navigation, collision regulations, first aid, firefighting, personal survival and safety, and at-sea training in the form of shadowing experienced officers at sea as Deck Cadets. After training both onshore and at sea and sufficient sea time, Deck Officers will start their career onboard as a low ranking Officer, which depending on the size of the ship might be Third, Fourth or Fifth Officer. Promotion is possible from Third Officer to Second Officer, to Chief Officer and, ultimately, to Master. With a clear career path from the start, becoming a Deck Officer puts you on first rung of the ladder to becoming the Master of a ship. What are the shore-based opportunities when I am ready to leave the sea? There is a great demand for those with seafaring skills and experience! 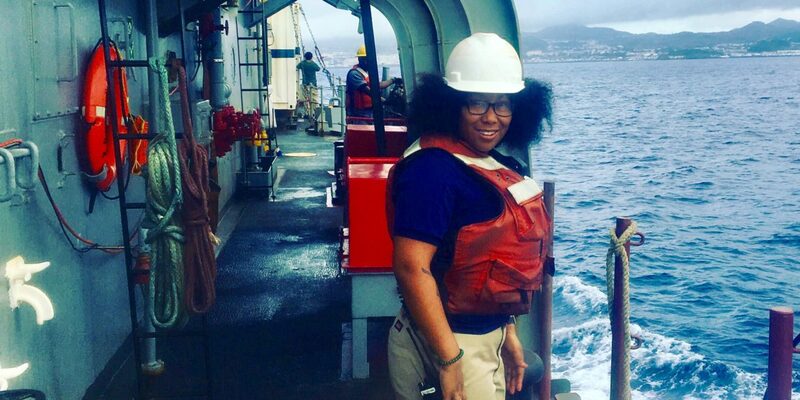 Meet New Yorker, Amanda Brown, straight from ‘The Big Apple.’ A graduate of SUNY Maritime College, Amanda earned her Bachelor’s Degree in Marine Transportation, which included a minor in Ship Management. Amanda has a U.S. Coast Guard Second Mate License of Unlimited Tonnage Vessels and has been working on ships for the past 3 years all over the world – from the US East Coast to Eastern Europe. Women Offshore spoke with Second Mate Brown, where she divulged an interesting tidbit about a very unique crewmate of hers, named Barney. Amanda, what inspired you to work on the water? What sorts of challenges have you faced in your career? What do you think can be done in your industry to encourage more women to pursue similar careers? Who is Barney and how did he end up joining your crew? A dog with a year of sea time – not bad for a pooch! How does Barney handle being at sea? Does he get seasick?! What has been your greatest adventure with Barney at sea? *Swim Call: “Swim call on a ship is when the ship stops in the open ocean and allows for a couple hours of swimming in the waters around the ship. It’s a time honored tradition on all classes of ships for hundreds of years. Prior to the availability of a continuous supply of fresh water, it was the only opportunity to bath as well.” – Charles Green, Retired USN Submarine Service.